Comments A delicate beauty, with divine spring green colour, and cut elegantly to bring out the lustre, which radiates and sparkles invitingly! This divine gemstone from Colombia is fully natural, and totally untreated! 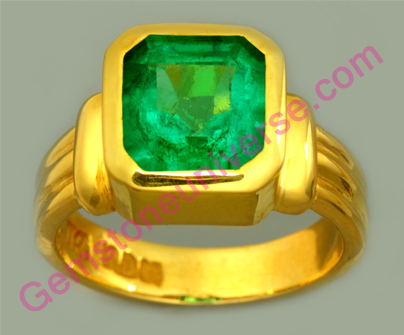 It is an alluringly beautiful gemstone, and the allure has intensified with this regal and neatly crafted gold ring! Natural Emerald, the gemstone for the planet Mercury!